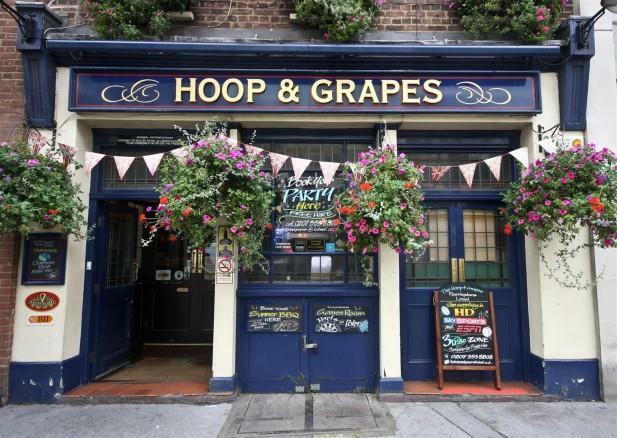 Last Wednesday’s meeting was at the Hoop & Grapes, and we were delighted to have many guests attending. Florian kicked off the evening with the President’s introduction before handing over to the Toastmaster of the evening, Sarah, to guide us through the evening. Sarah introduced the functionaries, starting with Andrew as Timekeeper, showing how the stats role can be made fun and lively. 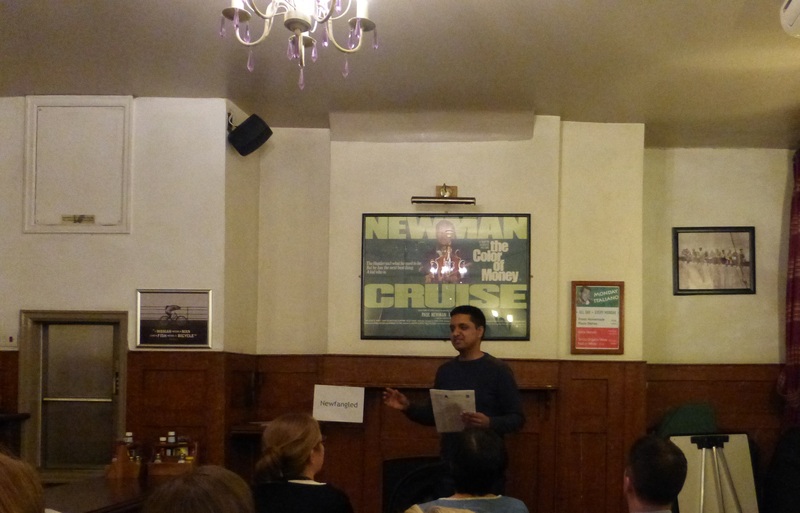 Next came Sumit as the grammarian, introducing the word of the day “Newfangled”, encouraging speakers to use it as much as possible. Then came the speeches. 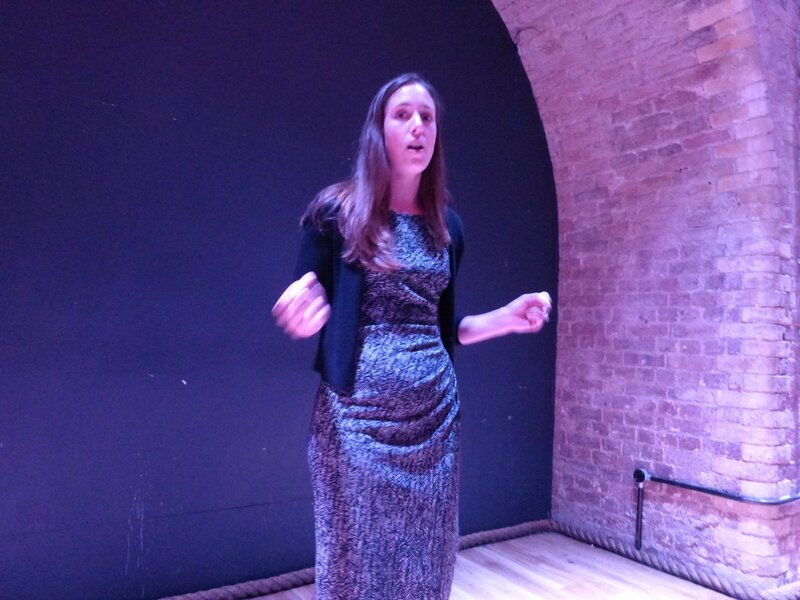 Caroline gave her third Toastmasters speech “Mind full or Mindful” talking about the benefits of Mindfulness, as a way to rescue our besieged minds from content overload. Michael’s gave the next speech – titled “Ghost Stories” and he regaled us with suitably spooky (Halloween!) ghoulish stories from his old school. Our final speaker Elena gave a speech that she is practicing as part of a Toastmasters competition, titled “Wanted: 1 husband” in which Elena humorously told us about her tireless efforts to find a husband, helped/hindered by her family. After the break came the evaluations, starting with Thien who congratulated Caroline on her speech, and reminding the audience on how well Caroline did in making things very visual. Mikhail gave a thorough evaluation of Michael’s speech, reviewing the structure of the speech. David congratulated Elena’s speech, making good points on body movements. Then came the table topics – with a Halloween theme. 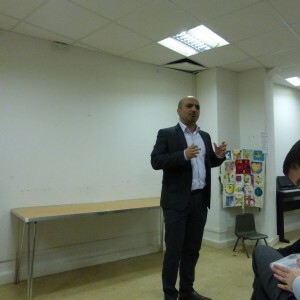 Many of the guests took part in the impromptu speaking and did extremely well. Sumit noted the many interesting word choices in his grammarian report, and just wished we used the word of the day more! 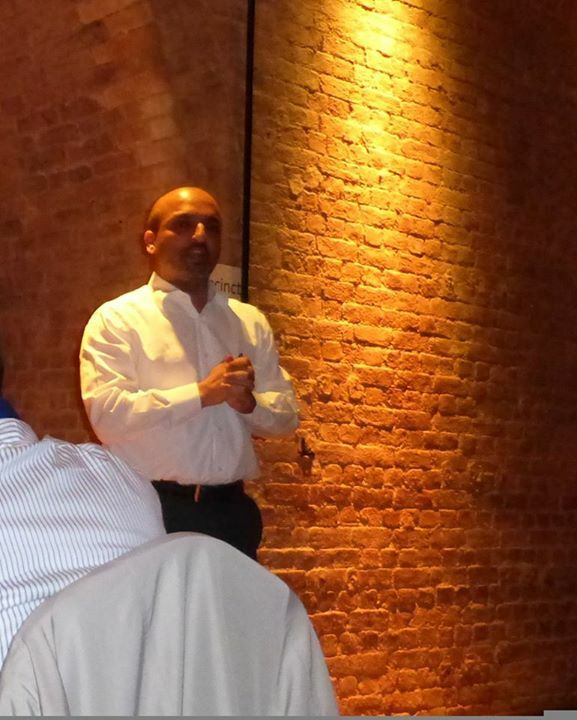 We were fortunate to have a General Evaluator, Swarajit, who evaluated the evening as a whole. 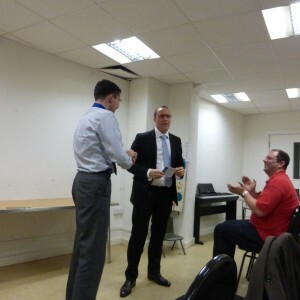 In our meeting last Wednesday our Toastmaster of the evening was Mikhail who guided us all through the evening’s events. 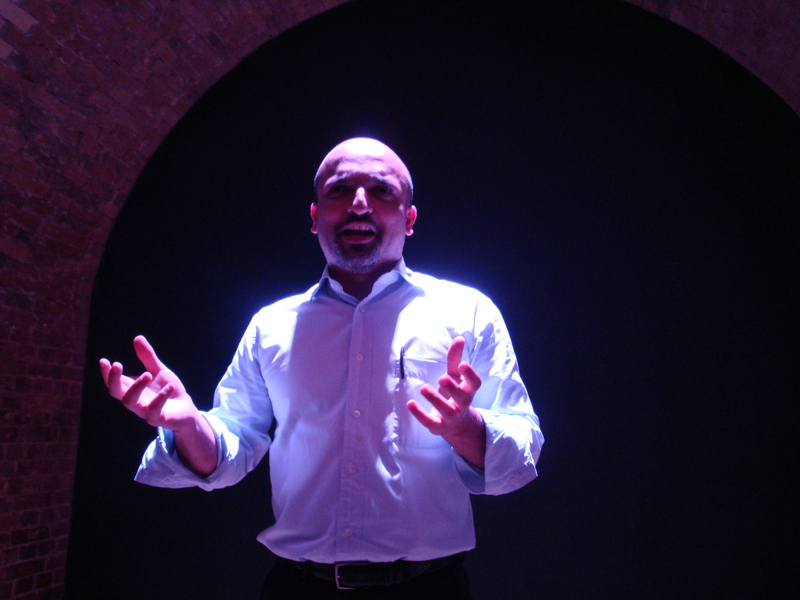 Mikhail first introduced the functionaries, starting with timekeeper Hamad, who explained his role of keeping time on the evening’s events. Next was Caroline, as the grammarian. Caroline introduced the word of the day “hyperbole” (meaning “obvious exaggeration”), encouraging speakers to use the word and to also use examples of hyperbole in their speeches. The prepared speeches began with Anne, who presented her first ever Toastmasters speech (well done! ), the “icebreaker speech”. 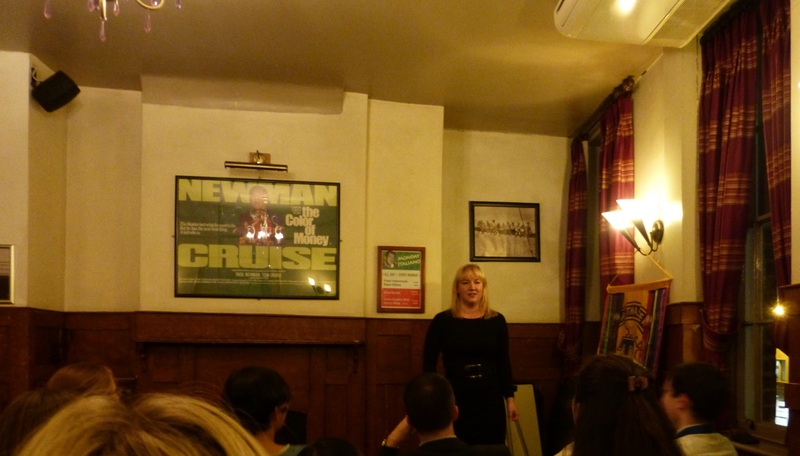 We learned about Anne’s life, moving from arty girl, to a financial analyst with a love for travel and family. Our second speech was given by David, who came on stage to deliver his speech “lads on tour” equipped with an appropriate stage prop – a glass of beer. 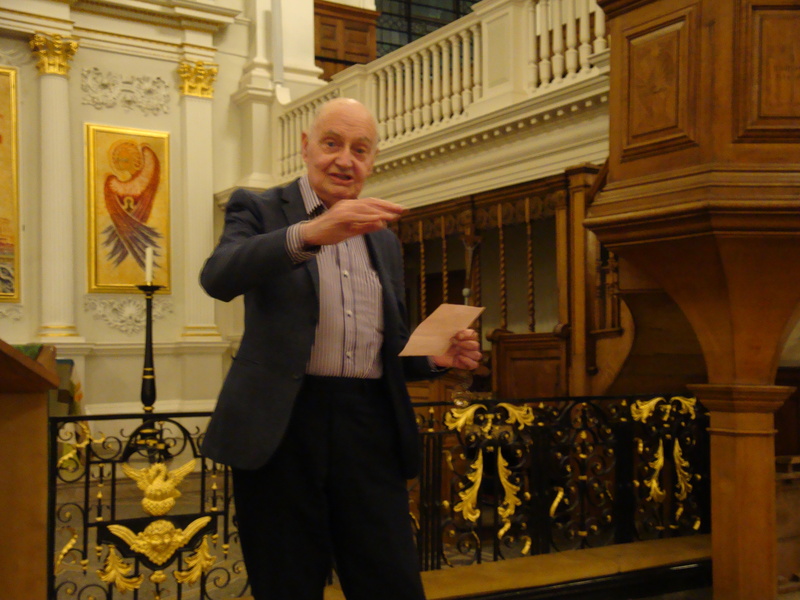 The speech was from the advanced manual “humourously speaking”, and David regaled us with tales of their night in Le Mans as part of a road trip in France. 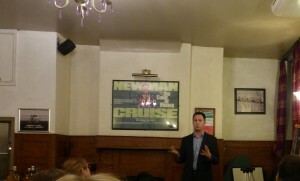 David took us through his evening in fun (and graphic) detail. Our last prepared speech of the evening was given by Christopher. 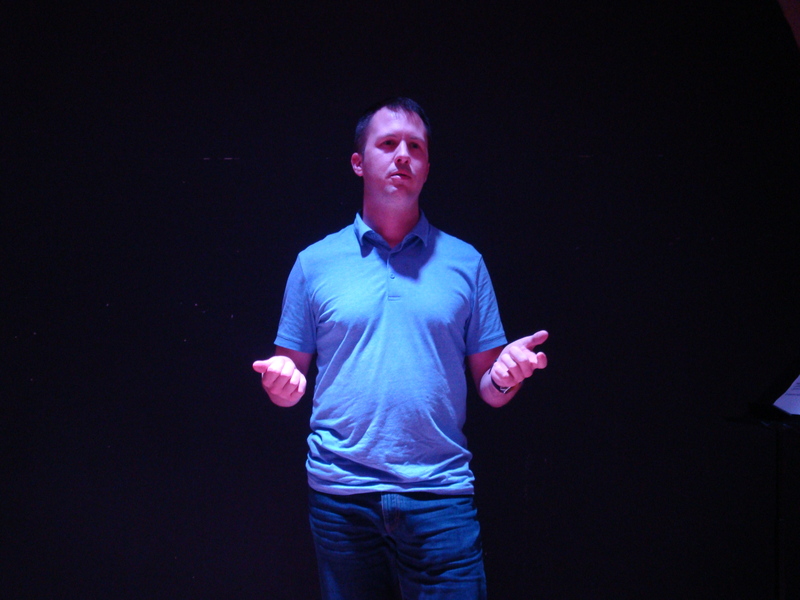 His was a technical presentation from the advanced manuals, and titled “Transferring big data over the Internet”. Christopher delivered a technical presentation, in a very clear and understandable way. 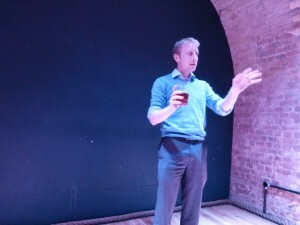 “Lads on Tour” a speech by David! After the break, the evaluations started with James evaluating Anne’s speech, congratulating Anne on her clear voice and composure. Michael gave a fittingly humourous evaluation of David’s speech, and Florian evaluated Christopher’s speech, picking up on some technical aspects of his speech. 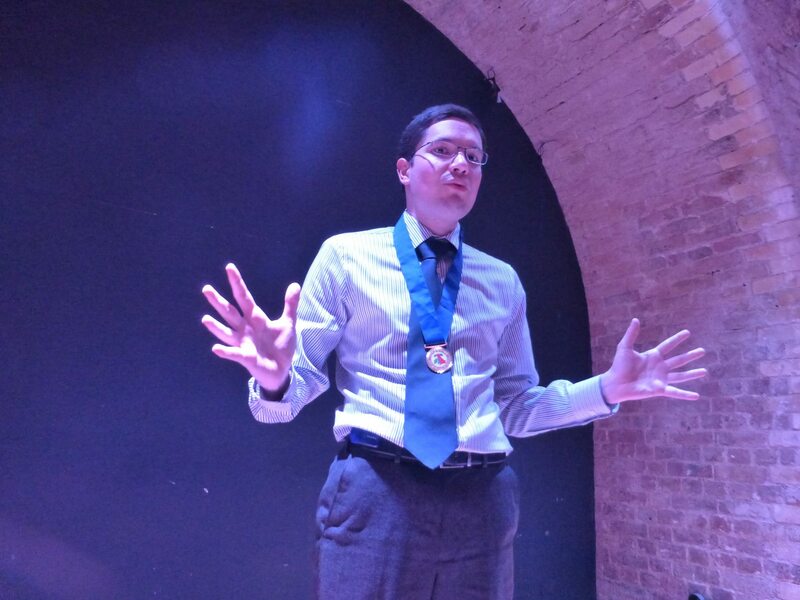 Then the Table Topics began, with Florian beginning his set of topics with some tricky open questions, such as “what came first, the chicken or the egg?” and “do you take it or leave it?” One of our new members, Andrew, won, with his quick and humourous answer. Dani gave an insightful and thorough evaluations of the Table Topics, followed by Caroline who made some comments on interesting word usage by the speakers, and congratulated those who had used the word of the day. We were fortunate to have an external general evaluator, Kate Osborne, who gave an evaluation for all those who hadn’t yet been evaluated, making interesting comments and ideas for improvement. 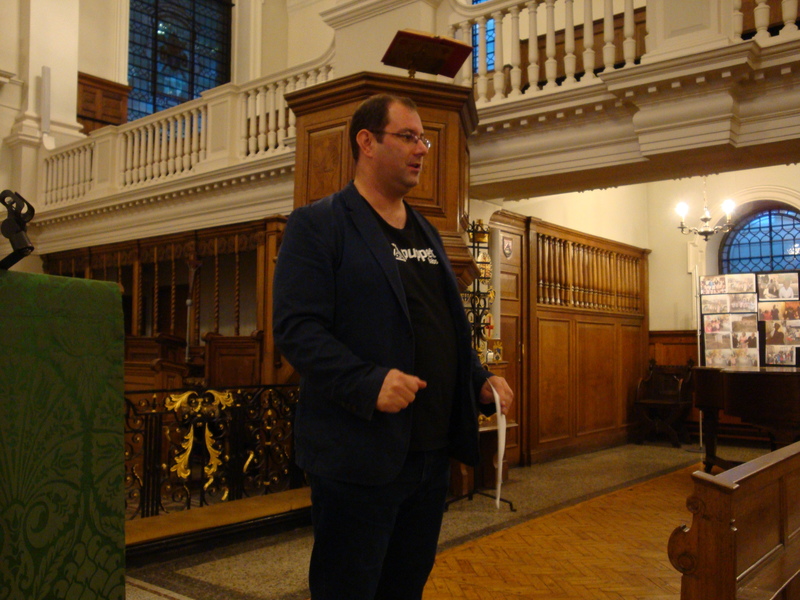 Our last meeting in St Botolph without Aldgate church meant that we were a “little bit closer to god according” to Toastmaster of the evening Michael. Nevertheless, with fabulous acoustics a a grand décor, the church is in many ways an ideal environment for a speaker! Keeping tabs on the time each speaker took to speak, was timekeeper Eliza. Looking after everyone’s language and those dreaded hums and err, was grammarian Christopher with ‘Audacious’ as word of the day. Our first speaker of the night was Dani urging us to ‘Challenge Yourself’ through his speech highlighting his experience of training to run a marathon. Dani had a clear and well structured message that positively reinforced his message. Objectives met for his second speaking project! 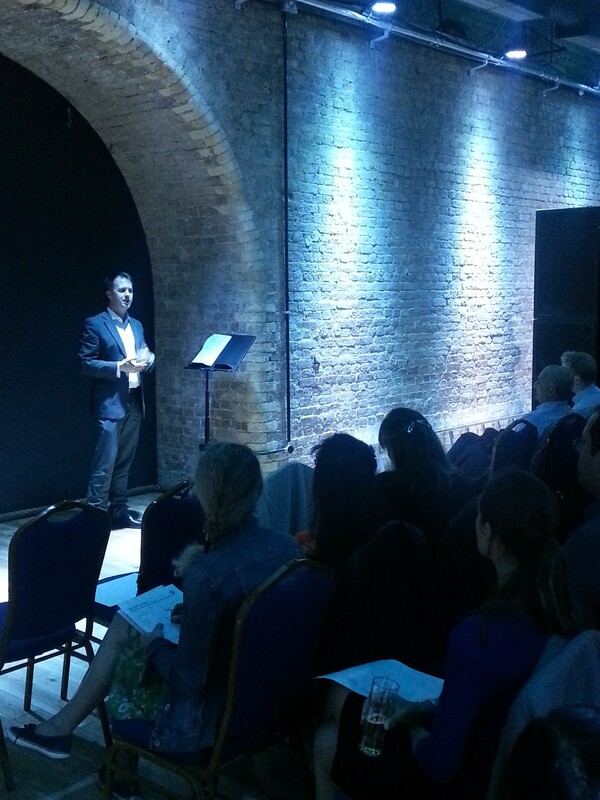 Following on was second speaker, club president Florian Bay with ‘A Collection of Poems’. His first poem was The Night Mail by W.H. Auden on the journey of the night mail trains from London to Glasgow. The second poem was famous poem Invictus by W.E. Henley. 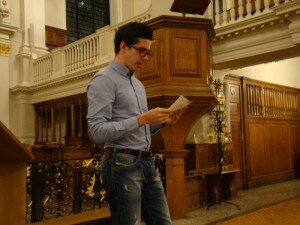 Florian used a series of vocal techniques to bring the poetry to life, as per the objectives of this interpretative reading project. 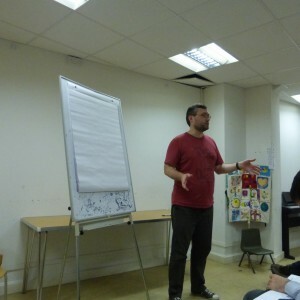 Finally, our last speaker was Alan doing an improvised speech on the history of New York City. Evaluating the first speaker was Alan who praised Dani’s structure but recommended that more drama be added to the speech. Sarah then evaluated Florian and commended his rhythm and use of vocal variety. Finally, Caroline evaluated Alan’s speech and praised his descriptive language. The table topics session chaired by Christopher had pictures from newspapers as overall theme. With participants having to invent the story or message behind these. Both members and guests had great fun in this session later evaluated by Caroline. 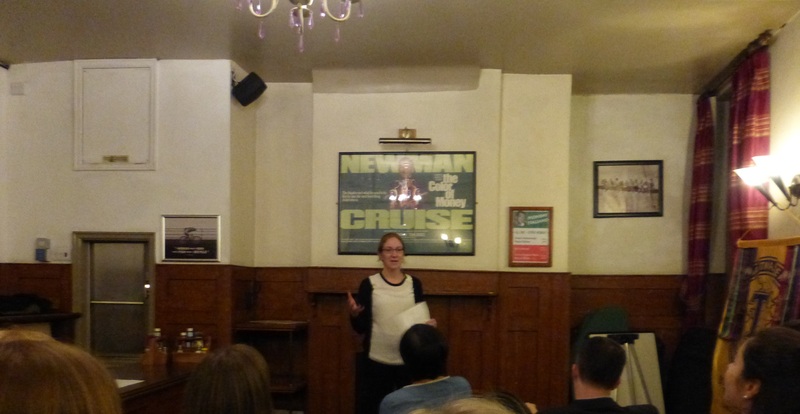 Finally the meeting was wrapped up with guest general evaluator, Svetlana’s report on how the club did this evening! One of our guests tackling a table topic! 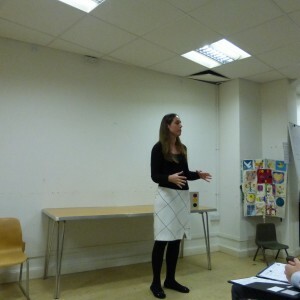 Twice a year every Toastmasters club holds a contest. The International Speech and Evaluation contests around March time and the Humorous Speech and Table Topics contests around September time. It was consequently contest time during our last meeting on September 9th! Following the presidential Introduction by club President Florian Bay, the reins of the meeting were handed over to the contest chair for tonight Michael. The first part of the meeting saw off three contestants vying for the best Humorous Speaker crown. Christopher started off with ‘From Bridget Jones to the valley of death’ recounting his skiing adventures in France with blonde monitor Sandrine and how he got to master the art of skiing on the slopes. The second speaker was Helen Mtshali ‘30 Days to 30’ on how she try to ensure the the hopes she had for her 30 years old self were realised career wise, love wise and health wise. The speech featured a lot of humour about her adventures while dating and at the gym, a place where “should could meet guys”! Finally the third speaker was Hamad Ali ‘That Happens in every culture’ on his mother’s attempt to arrange a suitable bride for him and how she carried out her search. If you have a BMW or are a doctor watch out this means you husband material! After a short break while the results were tallied by the chief judge and ballot counters. We moved on to the Table Topics contest. The table topic question all contestants had to answer was “If Aliens existed would you be happy or afraid?”. Club members Christopher, Hamad, Helen, Andrew, Eliza, Caroline and David took to the stage to answer the questions all kinds of ways. From the movie V to technologically more advanced aliens to other randomness featuring Aliens. We had it all and that’s what it so fun! The winners of Tonight’s contest were Helen Mtshali for the Humorous Speech contest and David Saer for the Table Topics contest, with Hamad second and Andrew third. 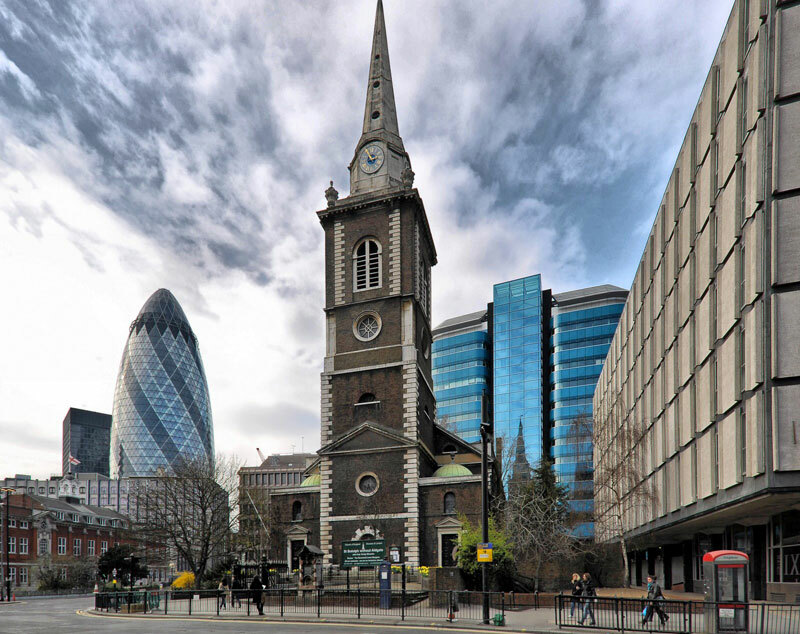 Our winners will be representing St Paul’s Speakers at the Area 33 contest on thursday 24th September in St Botolph Church Aldgate. Thanks to all the judges from other Toastmasters clubs whose help ensured that we carried out a textbook contest! Another month, another 4th Wednesday during which St Paul’s Speakers brought the arches of the Loose Cannon pub to life! Following the President’s introduction by Florian, inviting us all to exceed our limits and set ourselves goals as speakers and leaders. 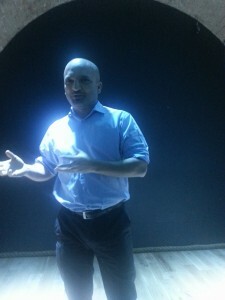 Club’s Vice-President of Education Mikhail then took over as Toastmaster of the evening. Keeping track of time and help our speakers stay on time, was Eliza. Listening to our speakers use of the English languages was Christopher, with ‘audacious’ as word of the day. Looking after our speakers use of time, timekeeper Eliza! The first of the night’s speakers was Katen for his very first speech, the Ice Breaker. In “Me Myself and I” Katen introduced himself to the club, telling us all about his family, his passion for cricket and work so far. Peppering his speech with humorous anecdotes and highlighting the important point that communicating well is power! Following on was Michael “Meetup” telling us how he met like minded fans of rock band The Clash and fellow bikers interested in doing tours all over the UK. Both speakers kept on time as highlighted by timekeeper Eliza. With Sergeant at Arms Caroline then taking the floor to introduce the fourteen guests presents that evening. The evaluation of the two speakers were done by Florian and Hamad. Florian recommended that Katen incorporates more vocal variety in future speeches, alongside a sharper conclusion. Hamad suggested using the whole of the stage to express oneself as this was in line with Michael’s speech objectives of using body language effectively. Chairing the table topics session of improvised speeches, was Dani. With “A day in the Life of” as theme. Various speakers described the life of a Vegas poker player, a circus acrobat, a samba dancer in Brazil, a sheep farmer in the Alps and James Bond among other occupations. Evaluating all the table topic speakers was Mikhail. The meeting concluded with Christopher’s grammarian report including a full count of hums, err and other verbal crutches. Followed on by Jeetesh’s general evaluation of the whole club. 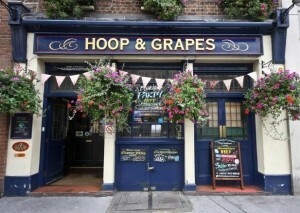 See you all at our next meeting. The club’s Table Topics and Humorous Speech contest! 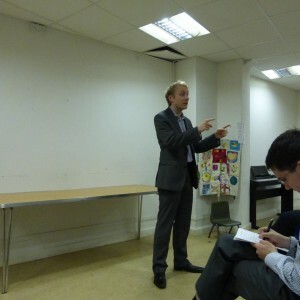 In last Wednesday’s meeting Avi performed the role of Toastmaster with calm confidence, providing a fun evening which was well attended by club members, and guests alike. Helen was the timekeeper of the evening, juggling the role with also being an evaluator; and Dani was the grammarian, introducing an excellent word of the day, “indomitable”. The first speech was Trisha’s “icebreaker”. Trisha told us part of her fascinating life, of her experience living in exciting places s…uch as New York and Trinidad, but nothing coming close to her love of Paris. 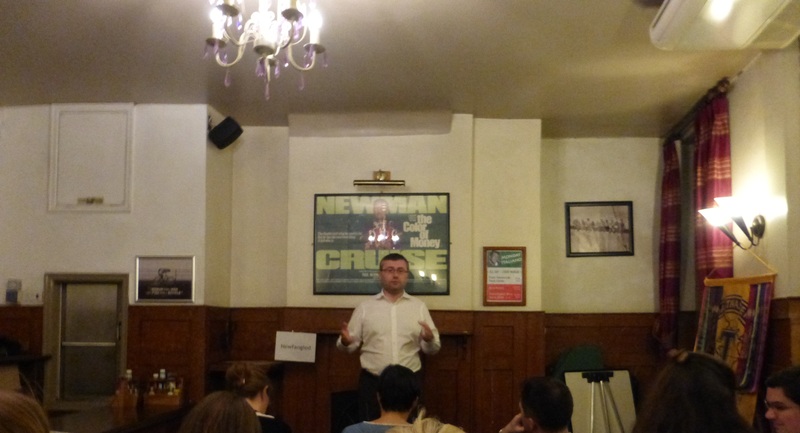 The next speaker was James, doing his eighth speech, which is all about using visual aids. James used visual slides as part of his speech, looking at the power of body language, persuading people to use their bodies to change the way they think and feel. Sarah was next up, also doing her eighth speech with another visual slide presentation, this time on Ice Hockey, persuading us of the merits over football – after all, there are more goals, more action and more fun to ice hockey – though Sarah made clear that hockey is not for the faint hearted. 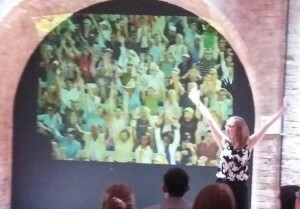 And the crowd goes wild by Sarah! After the break came the evaluations. Dennis congratulating Trisha on an engaging icebreaker speech and the confidence with which she delivered it, noting that we look forward to hearing the next one. Helen was the next evaluator, commending the speech and making recommendations on the visual aids. Florian evaluated Sarah’s speech, commending it on Sarah’s calm confidence and also making recommendations on visual aids used. 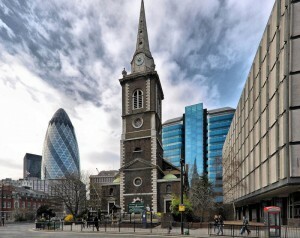 Caroline hosted the table topics session, which were based on the sites of the city of London, such as St Paul’s Cathedral, Guildhall, and Tower Bridge. With this fun table topic idea, Caroline asked speakers to pretend that they are the tour guide speaking about one of the sites, or else giving speakers the opportunity to just tell a story about the site. Mikhail did a thorough evaluation of the speakers – there were some really imaginative and very amusing speeches, and many of the guests took part, one of whom won best table topic. The other winners of the evening were Sarah (for her speech) and Dennis (for his evaluation). Before finishing, Dani gave his grammarian report, congratulating the meeting on the language used and reminding us of the importance of people using the word of the day. 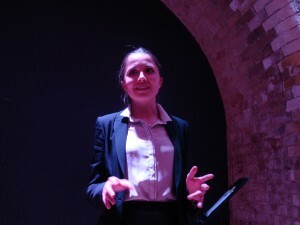 Ayse was the general evaluator of the evening (from Clerkenwell speakers). Ayse gave an amusing and engaging report on her experience viewing the events of the evening, as well as giving evaluations for all those who had not yet been evaluated. She congratulated the club on the laid back and fun atmosphere. 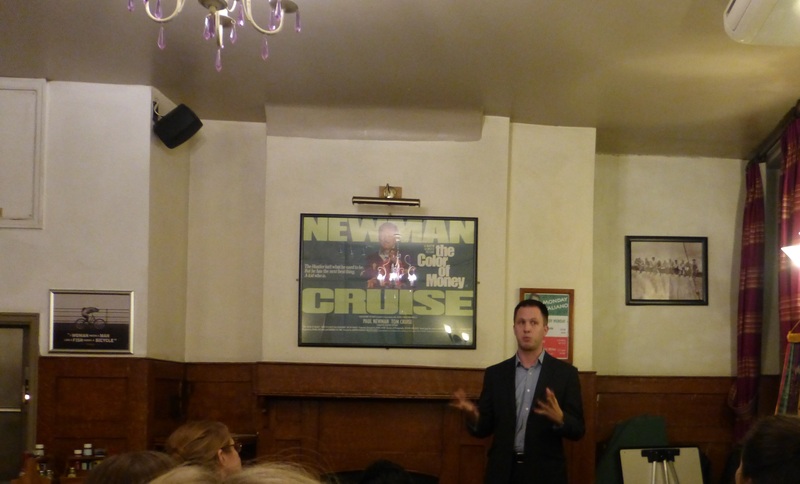 Thanks to everyone who came for making it such an fun evening! In our last exciting meeting on Wednesday, Hamad was Toastmaster. The theme of the evening was “forgetting” – have you had a time when you got home late at night and realised you’d forgotten your keys? Well, that’s exactly what happened to Hamad, and he introduced the functionaries and speakers with anecdotes of their various memory lapses. Toastmaster of the evening Hamad! Nadine was timekeeper of the evening, and James was the grammarian, introducing “succinct” as word of the day, which people tried to fit into their speeches. Florian gave us the first prepared speech, his being from the advanced manuals where the aim was to entertain. The speech demonstrated a very different side of the club’s president, as he entertained us with a story of his alcohol-fuelled wanderings in Liège. Florian brought passion and energy (and some serious street-talk!) to his story. 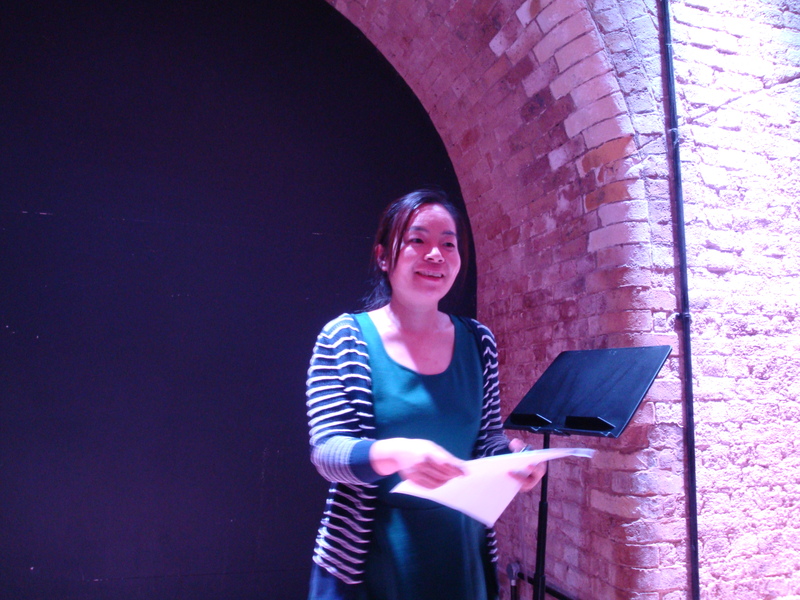 Our second speaker was Joy, with a humorous speech, again from the advanced manuals. Joy started with a question – “who likes animals?”, and proceeded to regale us with her experiences growing up on a farm, the animals proving a rich source of material. There were puns a many in the engaging and funny and warm speech – who would have thought that a toastmaster could be responsible for the school “ratgate” incident!? The evaluations of these speakers were done by Thien and by Caroline, who offered some skilful and enlightening comments on what the speakers did well, and ideas for improvement. Ross, a recently joined Toastmaster, had prepared some excellent and thought-provoking table topics for the evening, in which many members and guests joined in and faced such questions as “would you rather be a joyful simpleton or a tortured genius?” James was awarded “best table topic” for his answer. As part of the evaluations, Sarah gave some insightful evaluations of the table topics. James, as grammarian, congratulated everyone on using few filler words, and with high levels of language used throughout. Then Edward from London Olympians gave an thorough general evaluation, commenting on things that the members of the club did well and points of improvement. 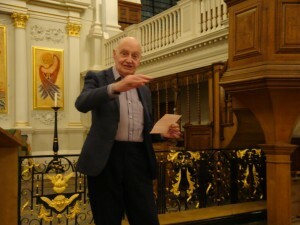 Before finishing the evening, David, the only member who had not yet spoken in the evening, was invited up on stage and presented with a table topic to do. David told us of the culinary delights of Northeast US – which was an excellent way to end, before we headed over to the waiting food.